The Buzz about Bee Condos! 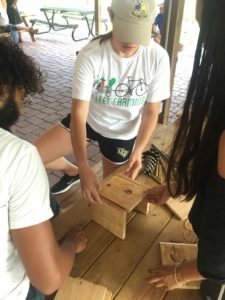 During National Pollinator Week last month, the UCF Arboretum hosted a bee condo building event to showcase just how easy it is to help pollinators thrive in your own garden by providing a home for them. 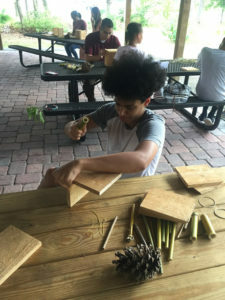 It was a typical hot and sunny summer day here in Central Florida, but that didn’t stop numerous students, families, and community members from coming out to learn about pollinator friendly flowers and to build habitats for the bees. 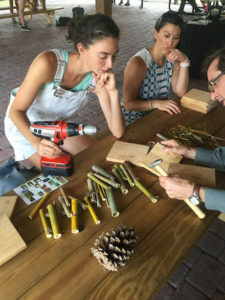 The event began with a tour around the colorful and lush pollinator garden and a brief Q&A about the Florida friendly flower’s species, origins, and ways to propagate them. 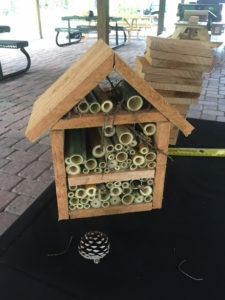 There are 315 different native bee species in Florida and with these condos, our community can help the bees thrive. Honey bees are responsible for pollinating 1/3 of the world’s crops making them essential to our own survival. Bee condos benefit many different types of bees, but they are especially beneficial to solitary bees. The larger holes of bamboo stick outwards so the bees can easily find their way in to burrow, lay eggs, and store honey. We also recommend sliding pieces of paper into the tubes of bamboo because that will prevent a buildup of fungus. Fungus also occurs because of excess moisture, so make sure the condo is in a dry area facing sunlight. Make sure to have a back panel on the condo so that the other side of the bamboo isn’t exposed which protects the bees from predators. If you want to build a bee condo for your garden, grab a friend and get busy! Step 1: Gather 8 pieces of any type of wood (it can be scrap wood), cut into squares and the dimensions can vary depending on the intended size. Make three pieces slightly larger as they will be the base and side panels, and make on smaller than all the other pieces, so it can be designated as a shelf within the condo. Step 3: Set the back panel on top of the base and in between the parallel sides, nail together making sure it’s sturdy and the nails are all the way into the wood, creating a base/firm foundation. Step 4: Set the pieces of the roof together, firmly, making sure it’s sturdy because the roof keeps the moisture out. Step 5: Slide the last piece into the center of the house to create a shelf, and then place the bamboo, pine cones, and shrubs on each shelf. Step 6: When mounting the condo remember to place it in an area of your garden or yard that is safe and dry. For more resources check out this video that was shown at the event!